The latest buzz going around at the moment has to do with the upcoming Netflix show The Defenders. There's a rumor going around that the big baddie in the show is going to be none other than Mephisto. I have no idea how credible this rumor is, but it's being said that Marvel wants to expand the supernatural element to their shows, eventually making way for Ghost Rider, Blade and Moon Knight to have series' of their own, or at least make some appearances. Mephisto is yet another of a long line of creations by Stan "the man" Lee and John Buscema. They based the character on Mephistopheles, a demon character from the Faust legend. In this issue of The Silver Surfer, Mephisto feels the power of the Sentinel of the Spaceways purity and kindness, and seeks him out to destroy him. He finds the Shalla Bal, the long lost love of Norrin Radd, and imprisons her in his dark realm. Norrin Radd is the true name of the Silver Surfer. The Silver Surfer follows them to Mephisto's lair to rescue her. Little does he know that Mephisto used Shalla Bal to lure him there. While there, Mephisto tries to entice the Silver Surfer to become his servant by offering him unimaginable wealth and power, but, of course, that fails so Mephisto then tries to destroy him. 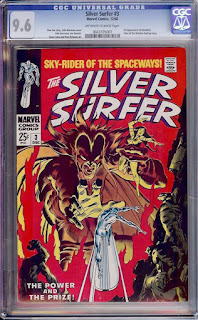 In the battle between the two, we get to see how powerful Mephisto really is, but he's no match against the power and goodness of The Silver Surfer, and in the end he defeats Mephisto, but not before Shalla Bal is sent back across the universe and far out of the reach of the Silver Surfer, leaving him alone and heart broken. There is also a backup story featuring The Watcher. It's a recreation of the story "Why won't the believe me?" that was originally printed in Amazing Adult Fantasy #7. Most of the copies that you will find online are going to be raw copies, but there are a few slabbers thrown in there too. As of right now, there have been 775 copies graded by CGC. That's a pretty good amount, but it's far from a lot. Hopefully CBCS will have a census soon so I can get a little more of an accurate number of graded copies out there, but for now, the CGC census will have to do. There are quite a few high grade copies between 8.0 VF through 9.8 NM/M according to the census, but only three are graded at the highest 9.8 NM/M. The most abundant grade at this point is an 8.5 VF+ with 98 copies. Sales for this issue have been inconsistent over the past two years. Some grades have seen an nice increase in value, mostly higher grades, while some other grades have seen a decrease. Obviously, if you can afford a higher grade, then that's what you should focus on. Higher grade comics will have a better chance of rising in value over their lower grade counterparts, and who doesn't want a nice looking copy in their collections. 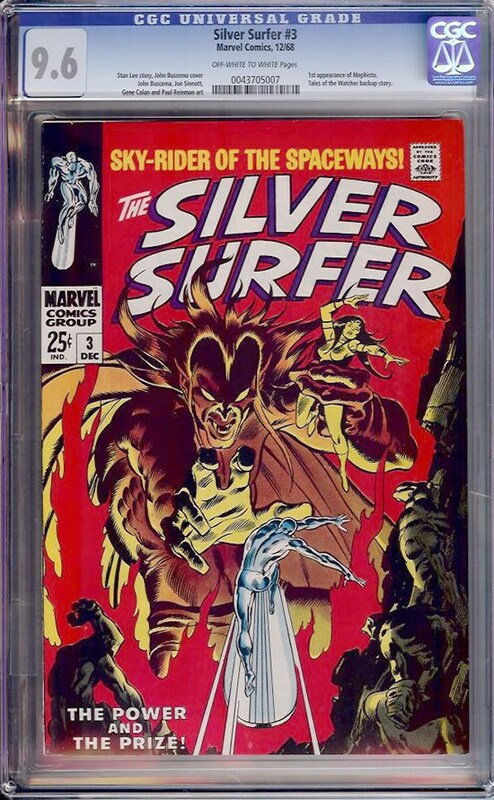 Buying a high grade copy of The Silver Surfer #3 won't break the bank either. The latest sale of a 9.6 MN+ graded book sold for $958, just under the $1,000 mark. You should be able pick up a nice 9.0 VF/NM copy for less than $500, and probably less if you can find it for auction as opposed to a buy it now. If you have a budget of around $200, you should be looking at copies around the 7.5 VF- or 8.0 VF range. Even though it's only a whisper of a rumor, and not even close to being confirmed in any way, this comic could see a boost in value. Every little whisper of a character appearing in a T.V. show or movie has some comic values shooting through the roof. Will it happen to this comic too? I guess we'll have to wait and see. I have to admit, that's really one weird rumor that's going around. I can see the character being a big bad for Blade, Ghostrider, Werewolf by Night in a Midnight Sons type of lead up, but the Defenders? Weird. I was thinking the same thing. There has to be a better way of introducing these supernatural characters. But you never know what's going through the minds of execs in Hollywood. I think they should fight a giant spider or polar bears.